Sell your PUDDLE JUMPERS items on eBay ! I guess that not many of you have heard about The PUDDLE JUMPERS, and if so, it's a shame. This is my first contact with the band too. The first time I listened through the album I wasn't impressed at all, but the next time I was already grabbed by some of the songs. Now I kind of like every song. They have released this CD on their own label Golden Goose Records, but it's so professional it could easily be mistaken for a major label release. From the music to the packaging it's top class. The packaging is a triple foldout with beautiful pictures and a nice booklet inside. This band is playing something that could be described as a mix between pop, Celtic folk music, country and progressive rock. I think that they are reminiscent to LLMAN BROTHERS BAND, BOSTON, The EAGLES, The HOOTERS, JETHRO TULL, KANSAS, PHISH, STYX, TOTO and YES. The members are fans of '70's progressive rock bands such as EMERSON, LAKE & PALMER, early GENESIS and RUSH, but I can't hear much of it in the music though, even if you sometimes can hear some bits and pieces that reminds of them. Maybe they aren't that original, but face it; every band can't differ from the others. They have got a lot of interesting instruments such as Mandolin, Hammond C-3 organ, Mini-Moog, Harmonica to go with the common instrumentation. They are tight musicians, and they have also put a lot of work on the background vocals with wonderful harmonies. The songs are well written and arranged. When I started to write down my favorites of the albums 15 tracks, I ended up with every track except "Savor the Moments", "A Matter of Time", "A Younger Year" and "The Many Sides of You". Need I say no more? If I had seen this CD with its beautiful packaging in the music store, I surely would've been curious to hear what the music was like. This isn't exactly the kind of music I listen to that often, but The PUDDLE JUMPERS is an exception and I hope that you check them out too. Highly recommended! 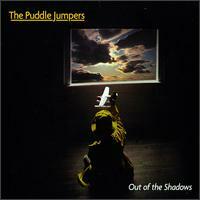 Post a review of THE PUDDLE JUMPERS "Out Of the Shadows"